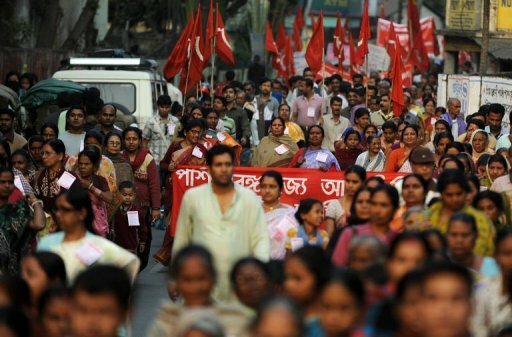 Millions of people, including members of the nation’s eleven largest trade unions, took to the streets across India today in a nationwide strike that seeks a remedy to rampant inflation, an end to the privatization of public entities, and increased labor protections — including calls for a social security system and a minimum wage. Tens of thousands of Muscovites wearing white ribbons ventured out under a light snow Sunday and formed a human chain along the entire 10-mile Garden Ring Road encircling the city center, creating a festive spectacle like nothing anyone remembers seeing before in the Russian capital. Thirteen Tibetans, detained last week for protesting against China in front of the United Nations office in Nepal, started an indefinite hunger strike on Monday to press for their release. Actress-turned-eco-warrior Lucy Lawless has been arrested with six Greenpeace activists after the group spent four days protesting aboard an oil-drilling ship docked in New Zealand. Dozens of women and young children from Kashmiri refugee camps holding placards inscribed with pro-freedom slogans staged a sit-in and a rally on Sunday to invite attention international community on Kashmir. In Pakistan, hundreds of tribesmen Saturday kicked off protests and a two-day sit-in against the U.S. drone attacks outside the Parliament House in Islamabad. Critics of the 22-year-old authoritarian rule of Kazakh President Nursultan Nazarbayev staged protests in four cities Saturday and were met by overwhelming police forces but little violence. Five disabled protesters in Bolivia have begun a hunger strike in their campaign demanding that the government pay an annual subsidy to disabled people. About 1,000 disabled Bolivians and their supporters rallied outside the country’s parliament building on Thursday following a 100-day protest journey to the capital to call for the $700 payment.